Now that the time has come to buy a tree stand, it is very likely that you are doing your research. One of things that you are going to want to look at are the best tree stand reviews out there. Reviews can provide you with experiences that other customers have had. These experiences should make it a lot easier for you to make your decision in regard to which product you are going to choose to buy. At the same time, it’s hard to take everyone’s experience into account, which is why you need to be aware of the quality of the reviews as you read. The following are some things to take into consideration when you are buying a tree stand. You need think about your budget. You don’t want to get something that won’t work for you. You may need to invest a little more to start if you want something truly durable, but there’s a possibility that you won’t know if you want to keep the first tree stand that you buy. You may eventually retire it for something different. If that is the case, you should exercise some caution when buying something expensive. You don’t want to have a tree stand in your attic that nobody ever even looks at just because you got a little overexcited. So here’s the bottom line: Regardless of how much money you have put aside for your tree stand, you may want to exercise caution, especially if this is the right time that you are going to buy a tree stand. An important thing to consider when is your level of experience. This is especially true for hunting equipment. A very experienced hunter and someone that does a lot of climbing may have no issues with a hanging stand. If you are just starting out, a hanging stand is a scary prospect. You have to ensure that the tree stand that you get fits with your level of experience. If you are getting a tree stand, it’s also important to remember that you are going to need a safety harness. Don’t worry, though, sometimes the tree stand comes with it. Depending on where you buy your sports goods from, you may be able to get safety gear for an inexpensive price in addition to your tree stand purchase. Where you are going hunting is very important. Some tree stands are only designed to be mounted on straight trees, for example. If you are going somewhere without many straight and sturdy trees, that is going to affect your purchase. Another thing that you need to take into account is the weather. If it’s going to be very cold, then you are probably not going to want to purchase a climbing stand. You may want to choose a box stand to protect yourself from the elements. You also must consider the foliage and environment around you. This includes the type of game that you are trying to hunt. If you are going to set up camp in one place for an entire season, you can buy a tree stand or build one yourself. However, you may find that you need to move your tree stand occasionally. It would be incredibly inefficient and time consuming to build, take down and then rebuild a tree stand every time. 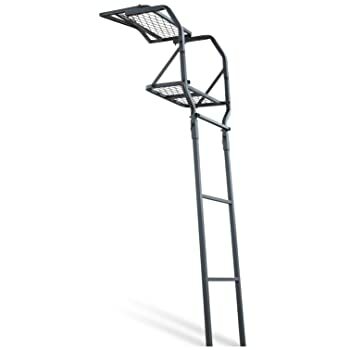 If you believe that you are going to have to move a lot, then it’s very important that you buy a tree stand that is easy to transport and to set up. There is nothing wrong with buying a tree stand at a gas station. Unless you are an expert huntsman, you are not going to be able to judge how good or appropriate certain tree stands are. While they can be very affordable, they may not be right for you. You may need extra protection. If you are an absolute beginner, you may want to go to a sporting goods store to have someone help you. Even if you aren’t a beginner, you should always consider several factors when you are buying a night stand. Make sure that you buy from a certified manufacturer. Tree stands are often higher quality when you have to assemble them yourself. Another thing to look for when it comes to judging the quality is the paint job — if there is craftsmanship displayed even in the cosmetic details, then you know you’ve purchased something good. One thing that you need to take into consideration is what you are buying your tree stand for. For instance, the tool you are using to hunt or if you are using your tree stand as part of several tree stands. These are personal things, but it’s important to keep them in mind before you make a purchase. Make sure that when you look for the best tree stand reviews available, you look out for things that reflect your own experiences. Remember, you can always ask experts at the store or enthusiasts in your community. 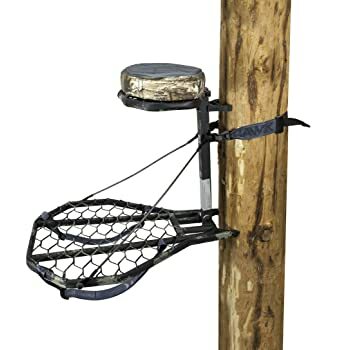 There are several different kinds of tree stands. Whichever type of tree stand you choose completely depends on your hunting needs. Some of these needs include your location, your level of skill and the season. It may even include what you are hunting! It’s important that you choose the one that a tree stand that fits your needs completely. You may want to look for the best tree stand reviews available before you make your decision. Generally, tree stands are used for deer hunting. You can also use them for hunting smaller or bigger game. It completely depends on where you are and what you are trying to achieve. Where you are going to hunt is also important. It also depends on the season. If you are going to be hunting somewhere warm with loads of trees and foliage, then you will need a certain type of tree stand. Hunting somewhere cold means that you’ll need a different stand. Your environment is definitely something that you need to consider before you buy a tree stand. How does a tree stand work? Well, in general, you can affix the tree stand to a tree. This is done so that you can have a vantage point that is better suited for hunting. Unlike a tripod stand, your tree stand needs to be on a tree. That is why it’s important that the environment that you are going to be in has several places for you to put your tree stand on. There are several advantages to using a tree stand over just being on the ground. It does take a little more time than just walking around and it costs a little more to start with. However, you can see things that the vegetation in front of you won’t allow you to see or that the foliage of the trees may block. If you find a tree a good tree, you can also leave your tree stand there for a while. Some types of tree stands are more movable than others, so take that into account. Here are some tree stands for you to consider. 1. 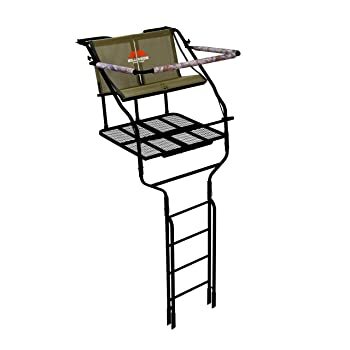 Summit Treestands Viper SD Climbing Treestand, Mossy Oak. The Viper SD is the most popular Summit model. There’s a reason this model is so popular! It has a very comfortable padded seat that can be raised and lowered, depending on what you are trying to do. It only weighs 20 pounds, so you can carry it around as needed. Incredibly comfortable and reliable, the structural enhancement of this product will make your experience safe. This product only weighs 12 lbs. It’s also very easy to assemble because there isn’t that much to do. Especially good for bow hunting, it is light, easy to store, solid and comfortable. The product is particularly good if you can’t leave your tree stand on trees overnight, because it’s very easy to both take down and put up. 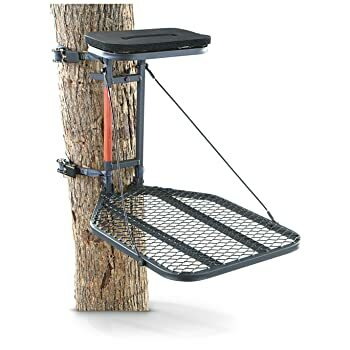 This spacious tree stand provides stability, which makes it perfect for long hunts. It has a padded climbing bar that you can use as a gun rest. It’s incredibly sturdy, too, as it supports up to 300 lbs. The traction ridges ensure that the tree stand is incredibly safe. 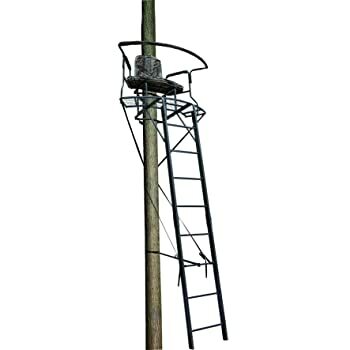 A Ladder tree stand is the most affordable way to get the benefits of a tree stand. This product is very lightweight and it’s easy to set up. It’s inexpensive and easily adjustable. It includes a safety harness and a safety DVD. It also has a 300 lb weight capacity. This product is perfect if you need to set up something durable. 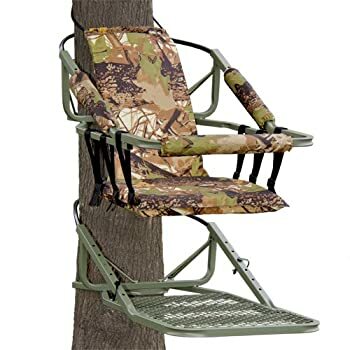 This roomy tree stand has space for two people. That makes it perfect if you are teaching someone new how to hunt! It is comfortable and durable. It’s also incredibly comfortable, with curved seats with cushions, padded armrests and a padded footrest bar. It also comes with a concealing blind. This product is built to last for a very long time. It’s also made to be incredibly comfortable, quiet and easy to set up. It has two tight sling seats and a capacity of 500 lbs altogether. The extended foot platform means that there’s plenty of room for all your gear. This lightweight tree stand is as easy to set up as it is to backpack. The large platform and padded seat provided plenty of comfort. The high end quality of the product does not affect its price, so you won’t be paying too much for a safe and durable tree stand. This product is compact and lightweight. It folds flat easily so that you can backpack it and only weighs 11.5 lbs. It has a capacity of 300 lbs. The seat is very comfortable and is built so that you can stay on it all day long. 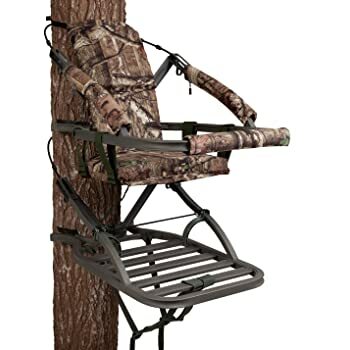 The Combat Hang-on is an affordable tree stand that features angle adjustment. It’s also very comfortable, which allows you to stay in place for a while. It’s also very durable. It’s built so that you can stay on there a while. Regardless of which tree stand you end up purchasing, remember that you are often only purchasing the tree stand. The majority don’t come with ladders and only a few come with a harness. You will probably need tools that don’t come with the tree stand in order to assemble it. You may also want to make sure that you purchase one with thorough instructions if this is the first time you have ever bought something like this. Don’t be afraid to ask questions, go out there and see what works for everyone else. That way, you will find something that works for you. Don’t worry if you get it wrong the first couple of times, either – just make sure that you stay safe! The more experience that you have with tree stands, the easier it will be to find something that works for you. Remember that the most important thing that you can do is research. You want to make sure that you stay safe. That’s why you need to be mindful of weight limits, always follow the instructions that come with the product and make sure that you buy certified products from manufacturers and retailers that you trust. Finding the right tree stand for your needs is probably going to be somewhat of an extensive process, so you should put time aside for it. A tree stand isn’t the kind of buy you make at the very last minute, after you are done purchasing the rest of the equipment you need for the season. This is not a purchase that can be considered lightly, since it doesn’t just affect how well you are going to do when you go hunting. 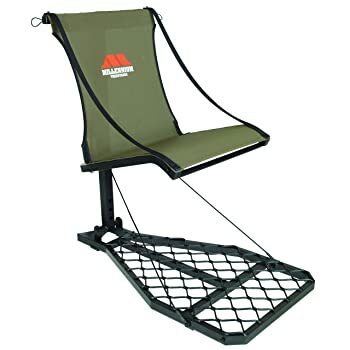 Your safety is the most important thing when you buy a tree stand, which is why you need to pay attention when you are reading the best tree stand reviews. You may also not want to go set up your first tree stand alone. For your own safety, it’s very important that you follow all the instructions and indications that are on the product that you buy. You also need to do research about which kind of products you may have to buy along with the tree stand. If you are on a budget, this is something that you really need to take into account. What about you? What are your favorite tree stands? What have been your experiences with them thus far? If there’s anything we missed or if you have any questions, please let us know! We would love to hear from experienced and inexperienced hunters alike. 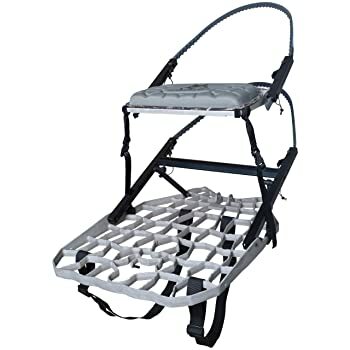 RoamOutdoor.com participates in the Amazon Affiliates program – If you make a purchase after clicking a link from RoamOutdoor.com to Amazon.com, we will receive a small percentage of the sale at no extra cost to you. Thank you for your continued support !